Construction of 4-storey head office building for Millicom Ghana Ltd. which is situated at Barnes Road, Accra. 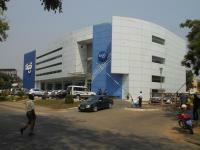 The building basically comprises of offices as well as data centre. The total size of the project is 3,500 square meters. Design and drawings, preparation of tender documentation and evaluation of all mechanical services as well as supervision of installations subsequent to testing and commissioning of the project.